“Nativity of Our Lord School, an integral part of a total Roman Catholic parish community, aims to provide quality education for students from pre-kindergarten through eighth grade. Religion, the core of the curriculum, emphasizes moral and spiritual values, which permeate every aspect of the total instructional program. Achievement, consistent with the student’s academic potential, is second only to those character traits that typify Christian ladies and gentlemen, as well as informed, law-abiding citizens. Participation in sports and co-curricular activities is encouraged and fostered at all levels. The philosophy of Nativity of Our Lord is based on a firm belief in the inherent and dignity of each individual. Accordingly, ample opportunities for spiritual and intellectual growth are available to all students. Our philosophy of education also reflects an awareness, on the part of the staff, of the diversity of economic, social and cultural differences within the school community. Click on a subject in the right column to view the policy or click here to download the complete handbook. Once you’ve reviewed each page, please click the link below to complete the Student Handbook Agreement form. The completed form needs to be returned to the school office. Have a team or an extracurricular group? We'll set-up a web page for you. 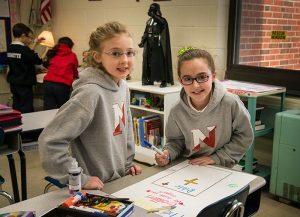 Just e-mail the details and any images you'd like included on your page to webupdate@nativityschool.net.